Named for the hard nodules it creates (it means 'stone' in Spanish), piedra is a fungal infection of the hair shaft. Because it damages the natural support structure of hair, the condition makes the hair fragile and prone to breaking. Left untreated, it can cause patchy Hair Loss that gradually extends to serious shedding. So how can you recognise it and intervene to minimise the damage? There are two main types of piedra: black piedra, caused by a fungus called Piedraia hortae, and white piedra, which can be caused by any one of six Trichosporon fungus strains. White piedra is the most common form in Britain but sometimes people pick up black piedra when holidaying in warmer countries and bring it back with them. Under the right conditions, both strains are highly infectious. White piedra mostly affects body and facial hair. It should be considered as a possible culprit in any case of unexplained, patchy Hair Loss In A Beard or moustache. Black piedra mostly affects scalp hair. In people with weaker immune systems, however, either type may affect hair all over the head and body. Piedra body hair infections should therefore be tackled quickly in case they spread to more troublesome locations. Like most types of fungus, piedra thrives in warm, moist environments. This means it can be transferred from person to person in family bathrooms, spa rooms and public swimming pools. Infection is more likely if there is head-to-head contact but spores can also travel short distances through the air. If you think you are infected, you should avoid sharing towels or clothes with other people. Piedra can also affect some species of animal. It's rarely a problem with pets but if you spend time with farm animals you should discuss any infection with your vet. The good news about black piedra is that its symptomatic nodules are very easy to spot. They're black in colour (hence the name) and are a few millimetres in diameter. White piedra is trickier as the nodules are often semi-translucent, enabling the natural colour of the hair to show through. While black piedra nodules are hard, white piedra nodules sometimes feel squishy and can resemble nits. Your doctor can run a simple test to tell the difference. If you can't see piedra nodules, you can usually feel them. Run strands of hair between your fingers and you will soon notice any distinctive bumps. Where piedra occurs in body hair, the simplest and surest solution is to shave it off. 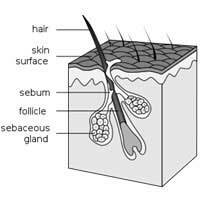 Because the fungus is only present in the hairs themselves, not the follicles or the skin underneath, this will usually wipe it out completely. If piedra affects your head hair, it's understandable that you might not want to shave. Where an infection is caught early, simply plucking out affected hairs can be effective. Get a friend or family member to help you search for the nodules. Because they can remain alive after removal and may still release spores, make sure you dispose of them carefully. In more advanced cases, trying to pluck away the problem can be a hopeless endeavour. Your doctor can give you antifungal pills and these are effective in the majority of cases. If they don't seem to be working for you, you can combine them with an ointment that uses the acid found in aspirin to poison the fungus. A bad piedra infection can leave your hair fragile in the long term. Following up treatment with a protein-based shampoo will keep it in better condition, but you'll need to take extra care with it until the affected part has grown all the way out.